As powerful storms, with lightning and high winds, ripped through the Northeast, the Twittersphere thundered with users uploading pictures. TODAY's Natalie Morales reports. Updated at 9:00 a.m. ET: At least two people were killed after severe thunderstorms unleashed heavy rain and strong winds across parts of the Midwest and Northeast on Thursday, grounding hundreds of flights and leaving tens of thousands of people without power. In Brooklyn, N.Y., a 61-year-old man was killed when scaffolding fell on him after lightning struck a church steeple, WNBC reported. 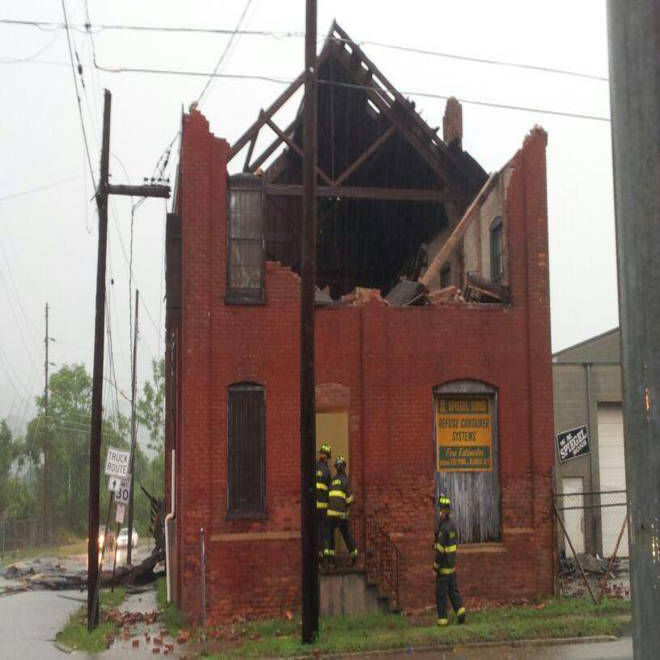 Police say the lightning brought down bricks onto some church scaffolding, causing part of it to collapse on the man as he walked by. He was pronounced dead at Long Island College Hospital shortly after the 8 p.m. accident in Cobble Hill. The Associated Press reported that a second person, a woman in Pennsylvania, was killed by a falling tree. The storms spawned a tornado that touched down in Elmira, New York, damaging a mall and a local country club, the National Weather Service said. Other towns across eastern Ohio, western Pennsylvania and upstate New York also reported downed trees. "Emergency crews are responding to numerous calls, including reported fires and downed power lines," the Elmira Star Gazette reported. "Many streets are impassable due to fallen trees and power lines, as well as traffic signals knocked out by power outages." As the storms sent black, menacing clouds rolling across some cities, hail ranging from the size of a dime to a quarter fell in some areas of Pennsylvania, AccuWeather.com said. More than 51,000 customers were without power in Ohio, said American Electric Power of Ohio. New York Governor Andrew Cuomo said in a statement that the storms knocked out power for nearly 93,700 utility customers across the state. 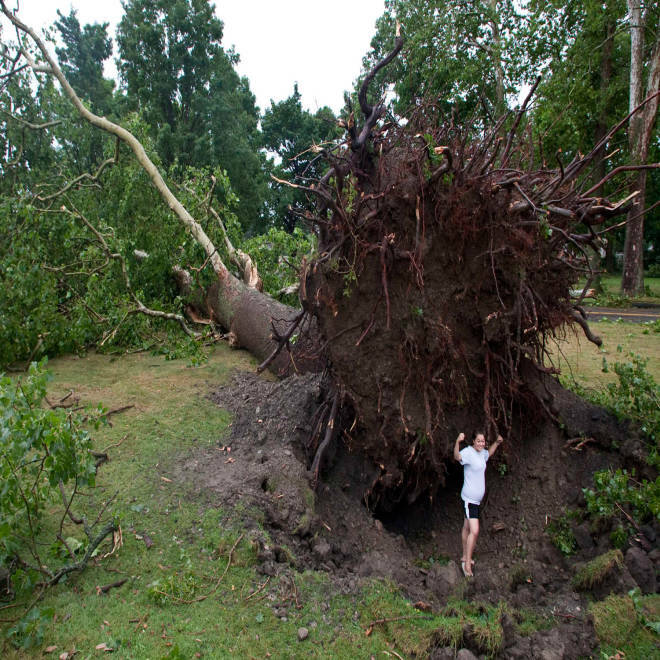 Jessica Stansfield poses for a photo below an enormous uprooted tree after the town was hit by a tornado in Elmira, N.Y., July 26. Severe thunderstorms unleashed heavy rain and strong winds across parts of the Midwest and Northeast on Thursday, grounding hundreds of flights and leaving tens of thousands of people without power. In New Jersey, more than 10,000 customers suffered power outages. A tornado watch was issued through Thursday night for parts of Connecticut, Massachusetts, New York, Pennsylvania and Vermont. The storm activity forced the cancellation of over 900 flights on Thursday, according to FlightAware, a Texas-based company that tracks the status of flights. The highest number of cancellations was at LaGuardia Airport in New York. 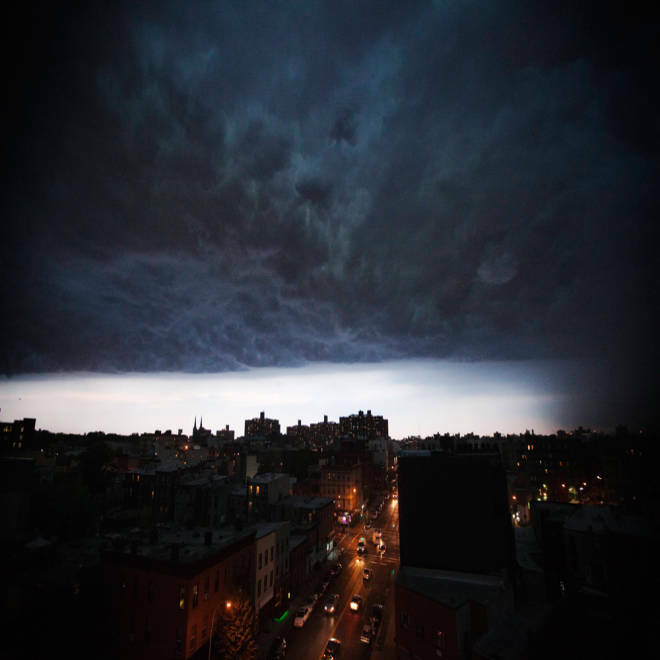 A storm cloud begins to dump rain as it passes over the Brooklyn borough of New York on Thursday. Flight delays were also reported at airports in Baltimore, Boston, Chicago, New York City, Philadelphia and Washington D.C., the Federal Aviation Administration said on its website. A severe thunderstorm watch was issued for portions of Indiana, Kentucky, Maryland, New York, Ohio, Pennsylvania and West Virginia. The National Weather Service's Storm Prediction Center said that "hail (up) to 2 inches in diameter, thunderstorm wind gusts to 80 miles per hour and dangerous lightning are possible in these areas." A tornado moved through Elmira, N.Y. on Thursday. Thunderstorms that swept through Westchester County, north of New York City, toppled trees and caused power outages. Trees fell across the tracks of the Metro North commuter rail system's Harlem Line and brought train traffic to a halt on the line north of Chappaqua, the town that is home to former U.S. President Bill Clinton and U.S. Secretary of State Hillary Clinton.